Awesome response to my giveaway already. Thank you to everyone that has filled in the form. I tell you, some of you girls out there have A LOT of nail polish!! Check it out here if you haven't entered yet. It would come as no surprise that I love holo polishes. But one of the biggest problems with some brands (I'm talking about you Nfu Oh) is that they flake and chip so quickly. I even have this problem with China Glaze OMG and Kaleidoscopes. I even read something about GOSH holographic being specifically made for party's and as such wasn't designed for longevity. 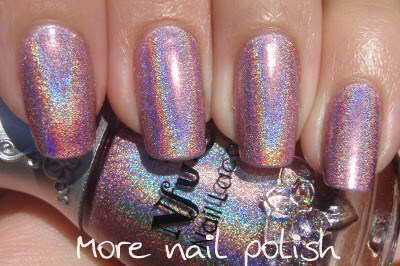 In doing my blog reading catch up I discovered some blog posts from mid last year talking about nail polish sandwiches. I thought I would try it out and do a wear test. 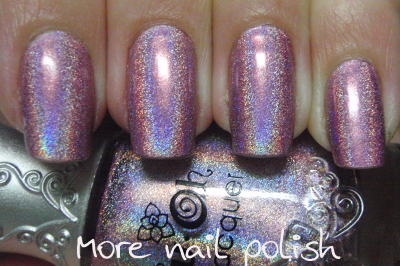 For my holo sandwich test I used Nfu Oh 63. 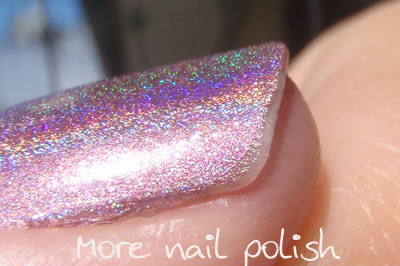 The pink holo. When I wore this in the past it didn't even last one day. I had chips at the edges and it just flaked off in big chunks (although I didn't use the Nfu Oh Aqua base, which is meant to help with this too). Here it is at the end of Day 1 - a full 24 hours of wear. End of Day 2 - full 48 hours. Look still no chips. End of Day 3 - I can't believe how good this still looked. My thumb at the end of Day 3. Yes there is wear there, but no chips or flakes. After three days I was just busting to change my polish. Especially as I just got a massive haul in the mail. 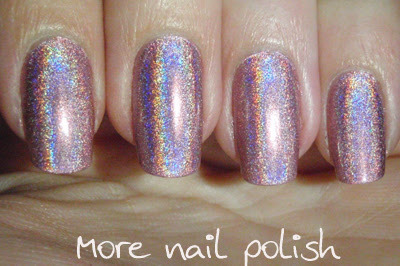 But I reckon this holo sandwich would have lasted at least two more days with only tip wear and no chips. Verdict: If I need my mani to last a few days or I'm going away for a weekend, then I'm taking a polish sandwich with me! Sandwich method sounds like a keeper! I have to say I'm a little like you, I get bored after 3 days of polish - hence I rarely bother with a top coat... sacrilege!